One of the inherent concerns about crowdsourced crisis information is that the data is not statistically representative and hence “useless” for any serious kind of statistical analysis. But my colleague Christina Corbane and her team at the European Commission’s Joint Research Center (JRC) have come up with some interesting findings that prove otherwise. They used the reports mapped on the Ushahidi-Haiti platform to show that this crowdsourced data can help predict the spatial distribution of structural damage in Port-au-Prince. The results were presented at this year’s Crisis Mapping Conference (ICCM 2010). Corbane and her co-authors “focused on the area of Port-au-Prince (approximately 9 by 9 km) where a total of 1,645 messages have been reported and 161,281 individual buildings have been identified, each classified into one of the 5 different damage grades.” Since the focus of the study is the relationship between crowdsourced reports and the intensity of structural damage, only grades 4 and 5 (structures beyond repair) were taken into account. The result is a bivariate point pattern consisting of two variables: 1,645 crowdsourced reports and 33,800 damaged buildings (grades 4 and 5 combined). 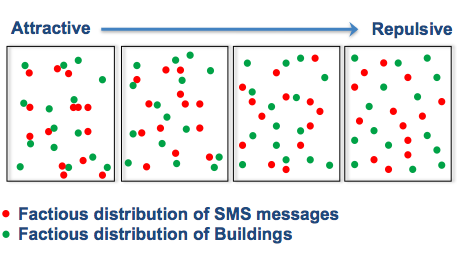 The above graphic simply serves as an illustrative example of the possible relationships between simulated distributions of SMS and damaged buildings. The two figures below represent the actual spatial distribution of crowdsourced reports and damaged buildings according to the data. The figures show that both crowdsourced data and damage patterns are clustered even though the latter is more pronounced. This suggests that some kind of correlation exists between the two distributions. 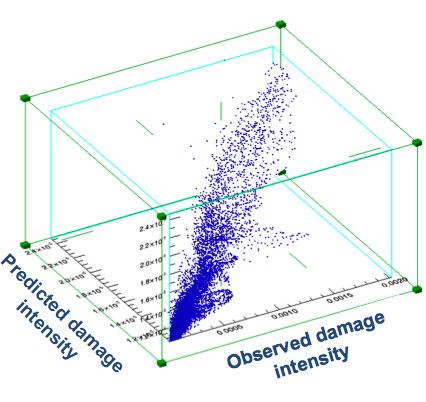 The co-authors then used the marked Gibbs point process model to “derive the conditional intensity of building damage based on the pairwise interactions between SMS [crowdsourced reports] and building damages.” The resulting model was then used to compute the predicted damage intensity values, which is depicted below with the observed damage intensity. The figures clearly show that the similarity between the patterns exhibited by the predictive model and the actual damage pattern is particularly strong. This visual inspection is confirmed by the computed correlation between the observed and predicted damage patterns shown below. In sum, the results of this empirical study demonstrates the existence of a spatial dependence between crowdsourced data and damaged buildings. 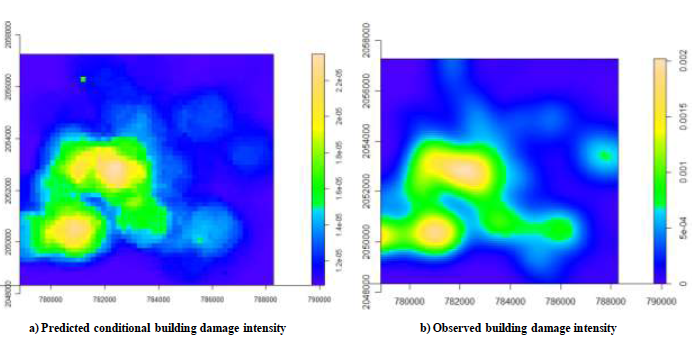 The results of the analysis also show how statistical interactions between the patterns of crowdsourced data and building damage can be used for modeling the intensity of structural damage to buildings. These findings are rather stunning. Data collected using unbounded crowdsourcing (non-representative sampling) largely in the form of SMS from the disaster affected population in Port-au-Prince can predict, with surprisingly high accuracy and statistical significance, the location and extent of structural damage post-earthquake. The World Bank-UNOSAT-JRC damage assessment took 600 experts 66 days to complete. The cost probably figured in the hundreds of millions of dollars. In contrast, Mission 4636 and Ushahidi-Haiti were both ad-hoc, volunteer-based projects and virtually all the crowdsourced reports used in the study were collected within 14 days of the earthquake (most within 10 days). But what does this say about the quality/reliability of crowdsourced data? The authors don’t make this connection but I find the implications particularly interesting since the actual content of the 1,645 crowdsourced reports were not factored into the analysis, simply the GPS coordinates, i.e., the meta-data. This entry was posted in Crisis Mapping, Crowdsourcing and tagged Haiti, JRC. Bookmark the permalink. Nice review of interesting work. A quibble on your estimate of how much the UNOSAT work cost. This was, in truth, larger than I expected, but far shy of your estimate of “hundreds of millions”. Yes, you’re right, that definitely is a quibble given the point/findings of the study. In any case, you’re forgetting to include the cost of the very high resolution aerial imagery for both pre- and post disaster. But even if you ignore the financial cost incurred in acquiring that data, are we seriously going to argue when comparing $32 million to close to $0? Not to mention the 66 days versus 14 days? Isn’t that missing the entire point of the study? You’re right though, that certainly qualifies as a quibble. Hey Christoph, sorry, just realized i may have come across as somewhat terse in my reply. I wasn’t quite sure how to calculate the approximate cost of the PDNA and yes, my figure may certainly be off. Would you have a link to the Corbane et al study? I have not been able to locate it and would be very interested to read it. A link to the study would be great. This is really fascinating. I would be interested to know if similar predictions could be made about disease outbreaks with crowdsourced data. I am one of the “et al”. Just to put things in perspective, those 600 experts contributed mostly by digitising damage artefacts in tiles of the aerial imagery. I guess 3 days full-time on average per expert is a more reliable estimate of that effort. Inside the UNOSAT/WB/JRC team, I’d say a total of 12 experts worked full time for 6 weeks on this. That will lower your cost by a factor 20. WB told me their imagery costs US$350,000 (not sure if this also included the LIDAR flight). Add Google and NOAA airborne to that, and you get to US$ 1,000,000 for imagery only. Beware of the context, however. The image analysis was done to come up with the damage, losses and needs in the housing sector. That was estimated at 6.5 BUS$, if I remember correctly. Our main motivation for the study was to see if the SMS patterns would have allowed for a better structuring of the damage assessment effort, eventually reaching a better accuracy, at lower cost, but always to make sure that the impact estimate was as close as possible to reality. That definitely helps, thanks Guido! And sorry I missed you at the JRC earlier this week. It was great to participate and present at ValGeo 2010. Great post and really interesting. Can you tell us more about how the experts modeled the data statistically, and what kind of distributional assumptions were made about the data. Also, were any other covariates collected to test joint spatial dependence or thrown is as controls on the models that determine the ‘significance’ of the crowd-sourced data? Lastly, any thoughts on how access to cell-phones in Haiti makes this study generalizable or have less external validity? ps. I have crossed out my numbers since they were orders of magnitude off. Looks great Patrick & Guido! where can we read more about the process undertaken and correction factors? Those are key IMO. Thinking about this geographic resolution, also made me wonder how the process corrects for population/traffic density overall. e.g. 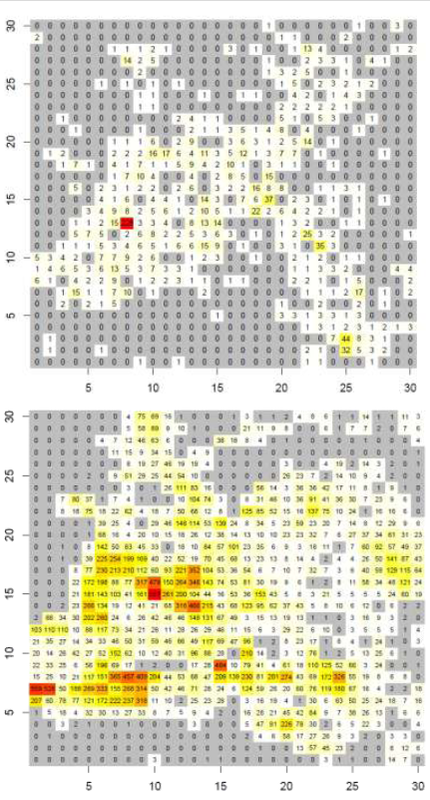 if you get a heatmap of density of cellphone subscriber transit in the period of the day when reports were sent; as a reference for correction; how much does it differ from the SMS data reports? 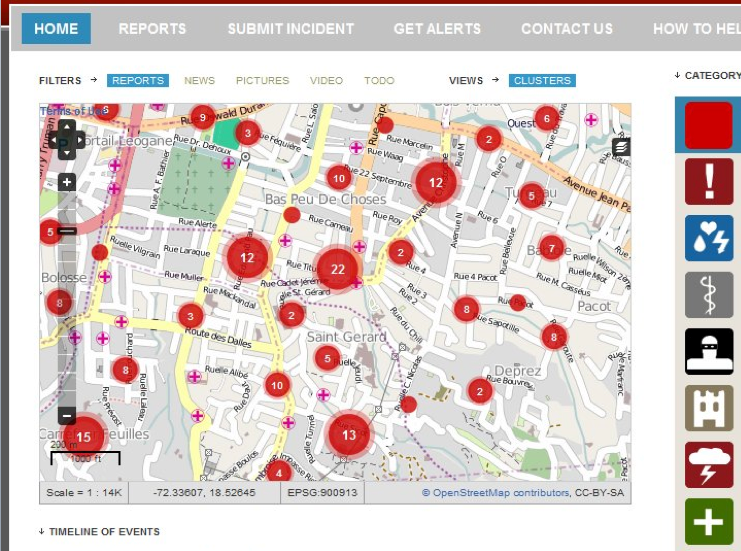 IMO the above seems to confirm what we in MapAction have felt about the potential value of Ushahidi in sudden-onset events – that the value lies more in the aggregate distribution of incidents than in the individual report contents. This is because a recurring problem in the field, especially in EQ disasters, is establishing the extent of human impact. If crowd data can be a reliable proxy for this, it will be useful. However it MUST be available quickly – within the first 48 hours or so – and is just one of a number of data sources that will be triangulated (government reports, conventional media, known areas of community vulnerability, overfly reconnaissance etc) before they can be used to set geographical priorities for field-level assessment. Just one other thing. Properly surveyed (rather than inferred) building damage assessment is very important for early recovery actions. In Haiti it would have been worth spending a lot of money (although never the ‘hundreds of millions’ – come on!) as a key evidence source for the PDNA which supported the appeal for $11.5bn of relief and reconstruction assistance. However, remote sensed (whether by imagery or SMS cloud) building damage data does not always, of itself, have overwhelming operational usefulness during the early stages of response. USAR teams are usually tasked based on structural triage which requires on-ground ‘sizeup’ and assessment. A/I don’t understand something. could someone help me. => so the granularity of the correlation is about several kilometers, isn’t it? B/Of course the next question: How to use such results? What is the consistency of such model for other earthquakes/crisis? One use case really cannot show something. So next step is to use this resulting haiti predictive model and apply it into another ushahidi platform used for another earthquake/crisis and check the confidence of the results. It’s only at that stage that the author could start to show the confidence and thus cost effective property of the method. This would be very interesting. I hope the authors will continue such research and not move to another topic as usual.